Acclaimed American actor, director, producer and Emmy Award winner. 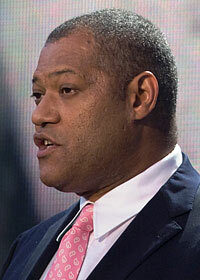 He is best known for his role as Morpheus in the Matrix film series. His other work includes CSI: Crime Scene Investigation, Othello, Predators and Mission Impossible III. Noland:"Finally found me, huh, big dog? Well, what took you so long?" Noland:"Noland, run away, live to fight another day. I'm the one that got away. The one you don't **** with." Royce:"How do we kill them?" Noland:"You're in my house ************!" Noland:"Hey uh, Agent Orange, you wanna put that down? Certain people around here are particular about other people messing with their ****." Noland:"Smelled you since you got here." Stans:"Wow, what a ****hole. You live here?" Noland:"Oh, no. No. This is my summer home. I winter in the Riviera. The schools are so much nicer there. And the men, Ooh, la, la!" Morpheus:"What can you see Neo?" Neo:"It's strange. The code is somehow different." Trinity:"Is that good for us? Or bad for us?" Neo:"Well it looks like every floor is wired with explosives."